Beware if you have small hands, you better star with the 1.5 inch first, i think black sponge balls are more deceptive if you do a routine in the night. Do you want to blow your audience away? GET SPONGE BALLS! Don't be fooled into thinking that they aren't cool, they hit HARD. Trust me, girls freak out. Imagine if you held one sponge ball in your hand and a spectator holds onto another. Then in FULL VIEW, you make yours vanish into thin air. You ask them if they feel it getting bigger and they will! When they open their hand YOUR sponge ball has materialized in THEIR hand! I personally recommend getting black ones because to me, they seem more mysterious and voodoo. I actually have a routine where I seemingly manipulate shadows. Anyway, sponge balls can be in ANY act whether it be stage or even mentalism, so grab a box today! They're cheap and will make your audiences explode! 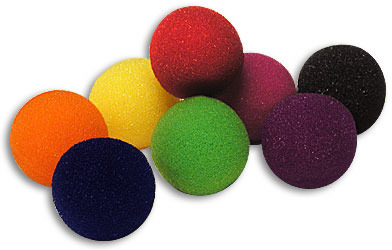 I would really recommend you get the sponge balls because you can add a lot of variety and versatility to your routines. You have to practice a lot though but at the end you can get great reactions out of simple magic. Oz does an excellent job of teaching you some routines, that are powerful and yet very easy to learn. I'm still working on my retention vanish, I can't wait to go out and actually amaze some people with this.